The Newest Rant: Marvel and Two of Its Quirkier Comics--"Hellcat," and, "Mockingbird"
Marvel and Two of Its Quirkier Comics--"Hellcat," and, "Mockingbird"
Not too long before it announced its upcoming, "Rebirth," DC had a promotion called, "DCYOU," where the idea was to make comics a bit more offbeat, fun, and otherwise quirky. It resulted in some quality comics, but they did not seem to actually sell that much, so off they go into our faint memories as DC gets ready to retool yet again. 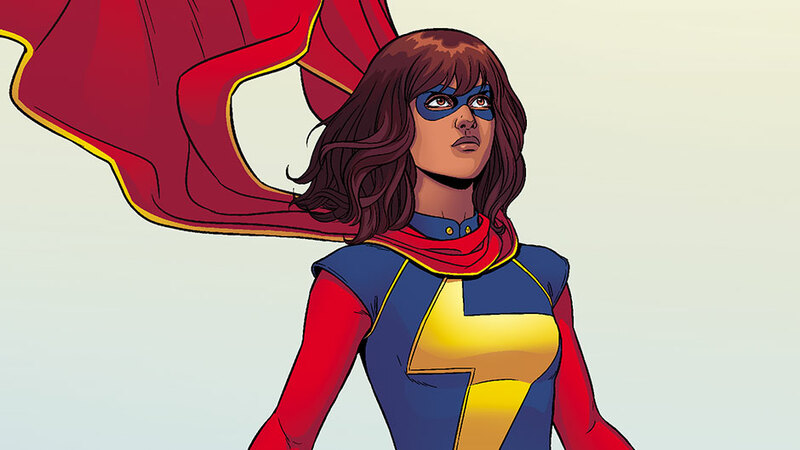 The thing is, Marvel has been making some quirky books for awhile now too, with some outright huge successes such as, "Ms. Marvel," and plenty of stellar books that deviate from the norm of what you might think about when you hear, "Super-hero comics." 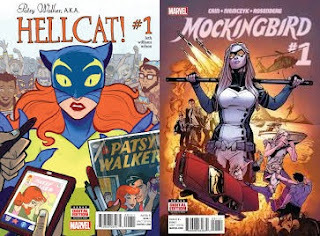 You've got the stellar, "Squirrel Girl," of course, and some other books including two I wanted to discuss a bit today--"Patsy Walker AKA Hellcat," and, "Mockingbird." I can agree with Patsy it feels this way sometimes. female-led books can struggle to gain marketshare. 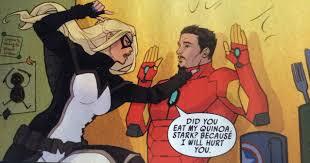 Quite often comics with female leads seem to get less attention. By that I mean the books get unimpressive writers and artists, minimal promotion, or suffer low sales. I'm not sure how these offbeat-books have been selling for Marvel (besides the previously-mentioned, "Ms. Marvel," which of course does gangbusters), but I hope they are doing pretty well as these aren't just, "Female super-hero comics," as they are superb comics that happen to have female leads. The writers are artists are indeed impressive and with their skills have given us some cool story-elements. 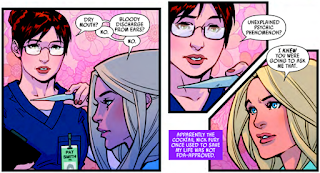 It is sad that books with women at the forefront seem to get less props, because as these two comics show, stories with female leads can be great! "Hellcat," has been telling a good story in that it is not too far removed from some of the other, "street-level," heroes as instead of having Patsy/Hellcat save the planet Earth or something, she is just trying to live life and fight some crime. 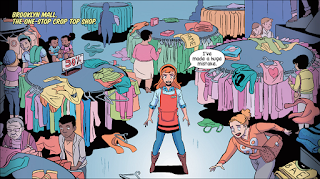 An interesting element that writer Kate Leth has implemented, however, is how the old romance comics from back in the day that Marvel actually published about Patsy Walker have been made in-canon somewhat, by having the story go that Patsy's mother made those comics, and now grown-adult Patsy is a bit haunted by all the people with a love for nostalgia reading about teenaged-Patsy (and many of us would rather forget chunks of our teen years). It is a bit meta, and a very clever way to make a fictional character's history all the more fascinating by taking the very nonfiction fact of her having had other stories made. Oh, and Patsy creates a temp agency for people with powers who want jobs but don't want to be off fighting crime--now that's really clever! 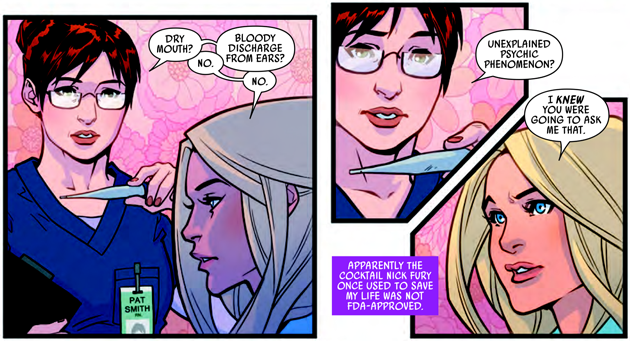 Mockingbird deserves mention because--as the writer Chelsea Cain admits at the end of the first issue--a whole lot doesn't make sense after the debut. Cain discusses how the comic is a five-issue, "Puzzle box," in that the first issue shows us bits of Mockingbird's life every few days, and issues #2, #3, and #4, will show three whole separate incidents before we enter the present/end of issue #1 with the fifth issue. It's strange, creative, and I love it. Plus, the comic is absolutely hilarious while at the same time having an air of sadness and foreboding in the first and second issues that have come out. After all, the main idea is Mockingbird has all sorts of strange super-serums in her normal body and things aren't quite reacting well in her due to that. If someone hadn't recommended this book to me with their discussing of how the issues are designed uniquely and the comic has a bit of that Matt Fraction-Hawkeye-vibe I would have missed out on a great book! The art in, "Hellcat," has a bright and free-flowing style and compliments the comic perfectly. Brittney Williams gives us something fun that, "Pops," with energy and has a wonderful mixture of being realistic at times, and over-the-top cartoony at others. Kate Niemczyk also is amazing on, "Mockingbird," drawing some gorgeous action scenes, such as in the 2nd issue where we have a full-page spread of our heroine jumping around and knocking-out foes. There has been discussion of how sometimes companies will feel like they have a, "House style," and I really like it when books feel like they're going against that concept with art that is impressively varied. As I stated, the more, "Different," kinds of comics seem to either strike a nerve and then hit it big, or suffer as relatively unknown (yet critically beloved) cult-hits. I'm not sure what is going to happen with some or most of these latest Marvel titles, but I sure do know that I appreciate when Marvel takes a chance on making something less cliche and more, "Out-there," than some books.